The icy world lies just six light-years from the sun. The nearest single star to the sun apparently hosts a big, icy planet. Astronomers have found strong evidence of a frigid alien world about 3.2 times more massive than Earth circling Barnard's Star, a dim red dwarf that lies just 6 light-years from the sun. Barnard's Star is our sun's nearest neighbor, apart from the three-star Alpha Centauri system, which is about 4.3 light-years away. "After a very careful analysis, we are 99 percent confident that the planet is there," Ignasi Ribas, of the Institute of Space Studies of Catalonia and the Institute of Space Sciences in Spain, said in a statement. "However, we'll continue to observe this fast-moving star to exclude possible, but improbable, natural variations of the stellar brightness which could masquerade as a planet," added Ribas, the lead author of a new study announcing the detection of Barnard's Star b. That study was published online today (Nov. 14) in the journal Nature. Barnard's Star b, if confirmed, will not be the nearest exoplanet to Earth. That designation is held by the roughly Earth-size world Proxima b, which orbits Proxima Centauri, one of the Alpha Centauri trio. NASA's Kepler space telescope showed that small planets are common in the Milky Way galaxy at large. 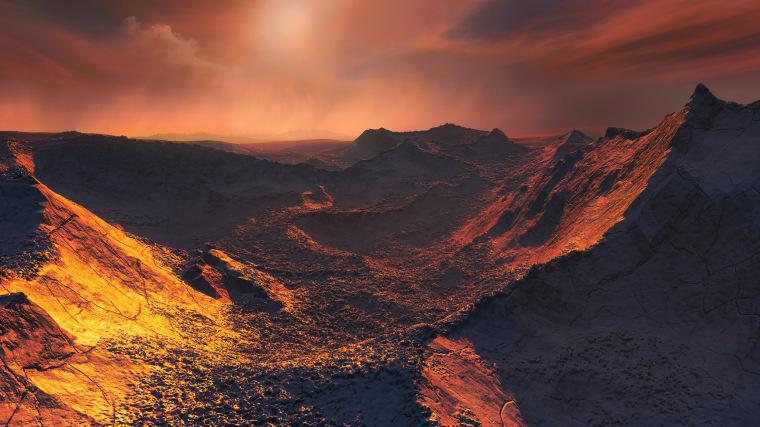 Together, Proxima b and Barnard's Star b strongly suggest that such worlds "are also common in our neighborhood," study co-author Johanna Teske, of the Department of Terrestrial Magnetism at the Carnegie Institution for Science in Washington, D.C., told Space.com. "And that is super-exciting." This unparalleled apparent motion is a consequence of the proximity of Barnard's Star and its high (but not record-setting) velocity of 310,000 mph (500,000 km/h) relative to the sun. And Barnard's Star is getting closer to us every day: In about 10,000 years, the red dwarf will take over the nearest-star mantle from the Alpha Centauri system. At that time, just 3.8 light-years will separate Barnard's Star from the sun. The habitable-zone concept is a tricky one, of course. Gauging a world's true habitability requires a strong working knowledge of its atmospheric composition and thickness, among other characteristics. And such information is hard to come by for exoplanets. Barnard's Star has long been a target of exoplanet hunters, but their searches have always come up empty — until now. And the new detection wasn't easy: Ribas and his team analyzed huge amounts of data, both archival and newly gathered, before finally digging up Barnard's Star b. "We used observations from seven different instruments, spanning 20 years of measurements, making this one of the largest and most extensive datasets ever used for precise radial-velocity studies," Ribas said in the same statement. "The combination of all data led to a total of 771 measurements — a huge amount of information!" Those seven instruments were the High Accuracy Radial Velocity Planet Searcher (HARPS), at the European Southern Observatory's (ESO) La Silla Observatory in Chile; the Ultraviolet and Visual Echelle Spectrograph on the Very Large Telescope, at ESO's Paranal Observatory in Chile; HARPS-North, at the Galileo National Telescope in the Canary Islands; the High Resolution Echelle Spectrometer, at the Keck 10-meter telescope in Hawaii; the Carnegie Institute's Planet Finder Spectrograph, at the Magellan 6.5-m telescope at Las Campanas Observatory in Chile; the Automated Planet Finder at the 2.4-m telescope at the University of California's Lick Observatory; and& CARMENES, at the Calar Alto Observatory in Spain. The researchers also detected hints of another possible planet in the system, orbiting farther out than Barnard's Star b — way farther out, with an orbital period of 6,600 Earth days. But this second signal is too weak to be deemed a planet candidate, Teske said. "There's not enough data," she told Space.com. Barnard's Star b is at least 3.2 times more massive than our own planet, making it a "super-Earth" — the class of worlds that are significantly larger than Earth but smaller than "ice giants" such as Neptune and Uranus. The newfound planet candidate lies 0.4 AU from its host star and completes one orbit every 233 Earth days, according to the new study. This orbital distance is similar to that of radiation-blasted Mercury in our own solar system. But, because Barnard's Star is so dim, the potential planet lies right around the system's "snow line" — the region where volatile materials such as water can condense into solid ices. "Until now, only giant planets had been detected at such a distance from their stars," Rodrigo Diaz, of the Institute of Astronomy and Space Physics at the National Council of Scientific and Technical Research and the University of Buenos Aires in Argentina, said in an accompanying "News and Views" article that was also published today in Nature. "The authors' discovery of a low-mass planet near the snow line places strong constraints on formation models for this type of planet," added Diaz, who was not involved in the new study. Barnard's Star b, if it does indeed exist, is not a very promising abode for life as we know it, at least not on the surface. The potential planet is likely very cold, with an estimated surface temperature of about minus 275 degrees Fahrenheit (minus 170 degrees Fahrenheit), study team members said. Confirmation of Barnard's Star b is unlikely to come from additional radial-velocity measurements, Diaz wrote. But super-precise measurements of star positions, such as those now being made by the European Space Agency's Gaia spacecraft, may do the job in the next few years, he added. "Even more excitingly, the next generation of ground-based instrumentation, also coming into operation in the 2020s, should be able to directly image the reported planet, and measure its light spectrum," Diaz wrote. "Using this spectrum, the characteristics of the planet’s atmosphere — such as its winds and rotation rate — could be inferred," he added. "This remarkable planet therefore gives us a key piece in the puzzle of planetary formation and evolution, and might be among the first low-mass exoplanets whose atmospheres are probed in detail." WANT MORE STORIES ABOUT EXOPLANETS?